From the picturesque town of Darjeeling, situated at an altitude of 7,042 ft (2,134 m), trek up through enchanting forests, ascending gradually to the Singalila ridge, with close views of Kanchenjunga (28,630 ft/8,598 m) the third highest mountain in the world. The ridge provides panoramic views of Nepal, Bhutan, Sikkim, Himalayas on three sides with Mt. Everest in the distance, fine view of the Nepalese valleys and of the plains of North Bengal with the snow fed Teesta on the east, Koshi on the west and a number of smaller rivers between them. A sunrise from Sandakpur is simply astonishing with clouds blanketing the valley, rising above is continuous barrier of snowy mountains, the most prominent which is Kanchenjunga (8598 m) towering up in gigantic height and breadth with it's attendant peaks Kabru (7338 m), Jano (Khumbhakarna - 7710 m) and Pandim (6691 m) clustering closely round it. Far of to the west among a group of other snowy mountain rising from graceful peaks of Everest group can be seen, behind the crest of Mt. Makalu. The contrast between Everest and Kanchanjunga is very marked. Age: Best suitable for beginners, children and old age people. Arrive at the airport in Delhi. Loben Expeditions representative will meet you outside the customs and immigration area and transfer you to your hotel. The afternoon is free to relax, recover from jet lag, or explore on your own. Our representative will pick you up at the hotel and transfer you to the airport for the 1½-hour flight to Bagdogra. Upon arrival in Bagdogra, you’ll be met by the trip leader of Loben Expeditions, and transferred to vehicles for a beautiful three-hour drive to the town of Darjeeling. Lunch en route. 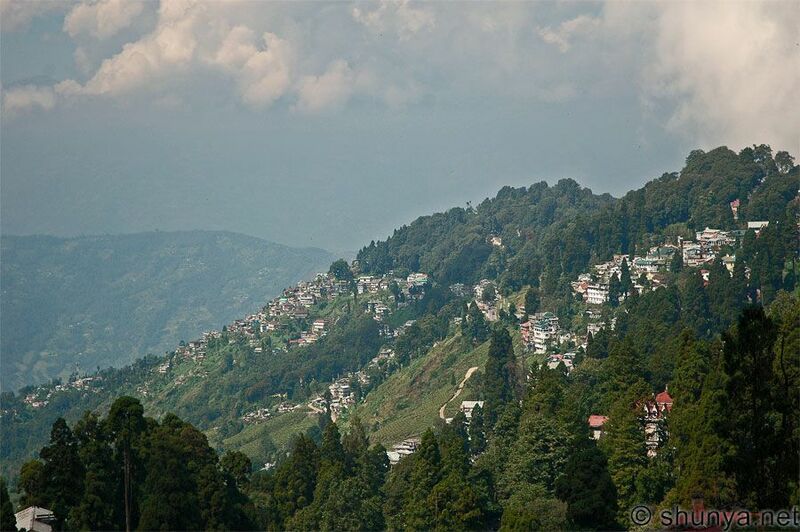 The drive takes us through lovely forests, little hill towns, and past some of Darjeeling’s famous tea estates. The serpentine road follows the route of Darjeeling’s famous “Toy Train,” an antique steam train on a narrow-gauge track that is still in operation. We’ll spend tonight and tomorrow night at one of the Heritage Hotel of British Era. If the early morning weather looks good for Kanchenjunga viewing, we’ll be awakened early for a drive to Tiger Hill to see glorious views of both Kanchenjunga and Mount Everest. (If this morning’s weather is foggy, we’ll try again tomorrow at sunrise.) We’ll return to the hotel for breakfast, then have a full day of guided sightseeing around Darjeeling. We’ll visit monasteries, schools, tea gardens, and landmarks such as the Himalayan Mountaineering Institute, started by the late Tenzing Norgay..
We start early in the day to cover the distance form Darjeeling to Manebhanjang about 26 km. The drive takes about an hour and a half. After some break here . We commence our walk from Manebhanjang to Tonglu. A steep climb up to Meghma (7 km - 3 1/2 hr. walk). Meghma is a small hamlet with few houses and a small monastery and impressive Chorten (stupa). Meghma to Tonglu is another 2 kms. The next days march from Tonglu to Gairibas (2621 m) and to Kalapokhari (3170 m). The firt let is downhill. With a distance of 9 km and it is a 3 hrs. walk. Gairibas to Kalapokhri is continuous climb through rhododendron forest - 6 km, 3 hrs.. There is a small pond at Kalapokhri (Black pond). The colour of the water is black and the amazing thing is that it never freezes. From Kalapokhri the road decends to Bikhaybhanyang - Valley of Poison (Aconites grow here) and from Bikaybhanyang to Sandakphu with steep climbs, narrow turns and views of Darjeeling town and Mt. Kanchenjunga can be seen along the way. 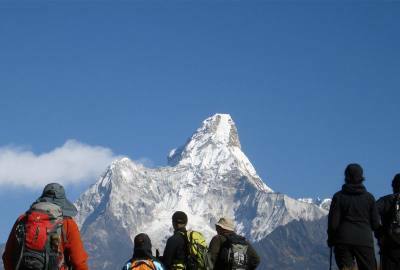 Sandakpur is situated at the beginning of the Singilala ridge and offers very good view of Mt. Everest and the Kanchenjunga range. The trek from Kalapokhari though steep, is short distance to bestow the clients with ample time of appreciate the views. The trek from Sandkpur to Phalut is comparatively easy going there are not many ascent. The trail is up and down with less degree of ascent and descent. The trail basically runs of the ridge of Singilala with beautiful views of valleys, rolling hills and snowy peaks through out the walk through the sparse vegetation of silver fur and rhododendron. 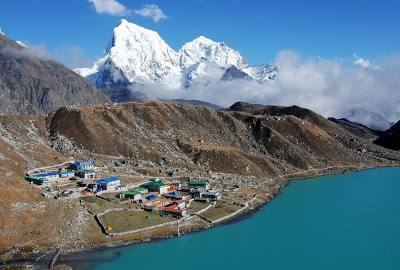 Phalut is a tri-junction of Sikkim, Nepal and West Bengal. The landscape is lifeless yet beautiful. After a hike to Phalut height in the morning. We will descend down steeply into the Ramman valley till to the twin village of Gorkhey and Samaden at the edge of Sikkim border. After exploring these small but interesting twin villages we will walk further 3 hours up till we reach Rammam village through the dense temperate forest. Ramman small forest village has one of the old monastery offers with beautiful valleys of Darjeeling and Sikkim. Early morning transfer to Bagdogra airport. Fly to Delhi and home onward/ or book our optional extension trip to have Delhi sightseeing, visit of Agra or Golden triangle tours. Loben Expeditions trips are designed for flexible, energetic people who like to be active and have a spirit of adventure and a positive attitude. We rate this trip as an “Introductory but awe aspiring.” You should not have be an experienced hiker however good health condition is required, as few of our days are spent at altitudes above 3500 m. Our hikes will be between five and six hours each day, broken up by a nice rest and a hot lunch. Porters or pack animals carry most of the gear and camp supplies, leaving you free to hike with only a light day pack. Though no technical climbing or other special abilities are required even so, trekking at high altitudes is strenuous. Exercise at high altitude compounds the physiologic stress. In addition, high altitude may create discomfort and symptoms of illness that you do not experience while exercising at lower elevations, such as shortness of breath, restlessness or sleeplessness at night, and headaches. You need to be in excellent health and top physical condition to enjoy such an experience, with adequate cardiovascular endurance, muscular strength, and excellent balance. Clients with heart and lung problems or blood diseases should consult their doctor before booking the trip. Altitude sicknesses are common & could be fatal if not taken well care. Our Tibet itinerary with couple days in Lhasa generally makes client fit enough & acclimatizes to continue his/her program. However, simple headache, fever, loss of appetite and stomach disorders can happen before the acclimatization. Advised, drink approx. 3 liters of water per day, do not strain yourself and take regular rests. Smoking and drinking should be stopped for at least first two days. Rucksack, wind and waterproof jacket, sleeping bag, peak cap, sun glasses, anti-sunburn cream, T-shirts and shorts, trousers, if the weather is cold, socks, stockings and gloves, flashlight, limited warm clothing. Ready to join this trip? If you would like to join in this trip, please click booking icon for our on-line booking form or email us along with your passport details. Booking fee of US $ 100 should be made by through PAYPAL or alternatively your can also bank transfer into our bank account that will be provided once we receive your booking form/email followed by a written confirmation of booking & trekking dossier of clothing, medical etc.